For the first time ever, there is substantial HOPE for children affected by Batten disease. The FDA and the European Medicines Agency (EMA) have each approved the first-ever CLN2 Batten disease enzyme replacement therapy called “Brineura”. Read here for this exciting announcement. I have been teaching for a really long time. I have given countless kids the tools to help them read and learn. I have spent many hours on the phone or in meetings talking to parents about their children. I have attended hours of conferences, classes and in-services. I have listened to guest speakers talk about the teaching craft and have read several books and articles to improve mine. I have sat on many school committees and volunteered to help at school functions. I have always loved what I do and have worked toward learning as much as I can to be the best teacher that I can. However, nothing, NOTHING will teach you more than life itself. This is not an affirmation or an opportunity for boasting. Rather, a revelation that I continue to learn, much like my astounding son who is finishing fourth grade. Harrison made this year an incredible learning opportunity for himself. He has grown in so many ways. What he has learned puts me to shame. I would like to share his learning and what we (especially I) can learn from him- all because he has a sister named Bridget. Earlier in the school year, Harrison’s teacher recommended a book that she thought he would enjoy because he could relate to the main character. As part of his homework, he has to write reflections about what he’s reading. Here are 2 entries he wrote after reading Drums, Girls and Dangerous Pie by Jordan Sonnenblick. I picked question 9 which asked how the book reminded you of yourself. I pick this because I can relate to Steven because Steven has a little brother who has leukemia and I have a younger sister who has a disease called Batten disease. Leukemia is a type of cancer. My mom had breast cancer, too. Steven is an average kid like me and has lots of interests. But, I don’t play drums like he does. I play baseball and football. 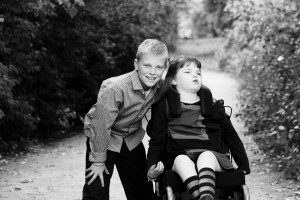 Living with special needs is pretty tough, but once you get the kinks out, it is easy. I think Steven is still figuring out the kinks, so it is still pretty tough for him. Steven tries to ignore that his brother has leukemia by playing drums. I forget that my sister has Batten by playing baseball or football. I think I can really feel what Steven is feeling and I know how painful at first and how depressed you are at first. But you have to struggle through it. It really is depressing to have a sibling in the hospital. Dear Steven, My name is Harrison. I too have a sibling with a severe illness. My sister has Batten disease. But even though it is hard, you have to stay calm because if you don’t stay calm your family doesn’t stay calm and your life gets a lot worse. This is a key thing, too, is to spend as much time as you can with your sibling. You can play games, hold their hand, hug them, talk to them, read them a story, watch tv with them, listen to music with them- stuff like that makes their day. Oh yeah, and make sure to still have fun doing hobbies for you. Don’t think about it that much because if you do, you won’t be a pro drummer. So just remember, have FUN! These reading responses were just the beginning. Harrison has been more in tune with what is really happening in our home and more pointedly, in his sister’s life. In a writing lesson about a piece of non-fiction information that each student knows well, Harrison chose to write about Batten disease. His project evolved into Disabled in Your Childhood. As the project took form and came to life, he ended with a 5 page typed report about kids with disabilities. We had many heartfelt conversations about what hope is and what it means to have faith. Here are some excerpts from his paper. 15% of the world has a disability. But do you think kids with the disability just sit there like statues? NO, they don’t because it’s not a setback. Rather, I think it’s a power to embrace more people than you ever could without a disability- to have HOPE! I don’t think kids should have a disability in their childhood, but if they do there is still hope. Hope can bring smiles, tears, joy, happiness and laughter. Hope can bring all these things and more. For those who suffer an illness, you can show us hope by showing that you are hanging on. For example, one day my sister who has an illness, Batten disease, showed a sign that she was being strong when she moaned and is sounded like “ma.” My mom heard it and she was so elated she was smiling ear to ear. That gave us a little hope that she was being tough and fighting her battle. Remember, hope is faith and faith is believing that something is going to get better. All this makes me think about a poster at my house that says. “No disease is too rare to have a cure, “ by the Every Life Foundation. I agree with this because if the disease is cured, kids with a disability can have fun and go where they want to go. But sometimes, I think it shouldn’t be cured because then no one would have hope and faith. This makes me realize that if no one had a disability, no one would work towards finding a cure. If no one works toward finding a cure, we would not be able to have HOPE!!! You can read the words of this 10 year old and see the flaws. But more importantly, you can see the emotion he puts into his thoughts and writing. Harrison has a beautiful way of looking at the situation and addressing it honestly. He is mature beyond his years when it comes to dealing with life and its lessons. As parents, we recognized this a few years ago when the whole world seemed to be crashing down around us. I was dealing with cancer and we all were dealing with Bridget, her seizures, clumsiness, complete regression and diagnosis. Harrison was a 14 year old in a 7 year old’s body. And, he continues to think and experience life beyond his years. Not only has our son learned many important lessons this year, he has taught us the most important ones of all. Have hope, be faithful and love your family unconditionally. I marvel at his wisdom. I will continue to look toward him for my learning because he truly teaches me more than any book, speaker or class could. How grateful I am to have him in my life and help me learn life’s most valuable lessons. Posted by Sara Kennicott on 5.28.2013 – There are 4 comments for this post, join in! Copyright © 2019 Hope 4 Bridget . Powered by WordPress	| Theme: Radium.